Cost: Donation: afternoon tea provided. Please RSVP to assist catering. St. Carthage (c.564- 637), known in Irish as Carthach or Mochuda, was born in Co. Kerry, and became the leader of a flourishing monastery at Rahan in Co. Meath. After forty years, local rulers, in association with hostile clerics, forced him to go south with his monks and a large group of ‘lepers’ for whom he cared. 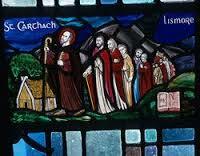 The exiled band went to Lismore, where his monastery became an important centre of learning. The early Lives place him in a tradition of figures modelled on Colum Cille. The presentation on 24th May celebrates the memory of St Mochuda (St Carthage) and other saints of Ireland across the centuries and the oceans, through readings from ancient Irish texts and through song. It includes the first public recitation from a Litany of the Saints in an Irish language prayer-book scribed by Dáibhí de Barra, now in the State Library of Victoria. The event marks eighty years since Archbishop Mannix laid the foundation stone for St. Carthage’s Parkville in 1934.